Desktop three-dimensional (3D) printers (D3DPs) have become a popular tool for fabricating personalized consumer products, favored for low cost, easy operation, and other advantageous qualities. This study focused on the potential for using D3DPs to successfully, rapidly, and economically print customized implants at medical clinics. An experiment was conducted on a D3DP-printed anterior cruciate ligament surgical implant using a rabbit model. A well-defined, orthogonal, porous PLA screw-like scaffold was printed, then coated with hydroxyapatite (HA) to improve its osteoconductivity. 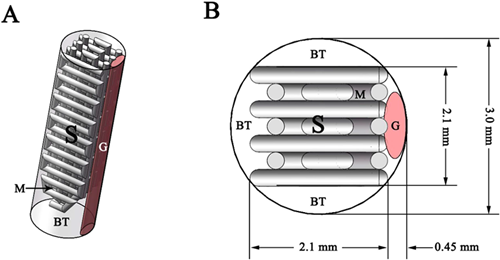 As an internal fixation as well as an ideal cell delivery system, the osteogenic scaffold loaded with mesenchymal stem cells (MSCs) were evaluated through both in vitro and in vivo tests to observe bone-ligament healing via cell therapy. The MSCs suspended in Pluronic F-127 hydrogel on PLA/HA screw-like scaffold showed the highest cell proliferation and osteogenesis in vitro. In vivo assessment of rabbit anterior cruciate ligament models for 4 and 12 weeks showed that the PLA/HA screw-like scaffold loaded with MSCs suspended in Pluronic F-127 hydrogel exhibited significant bone ingrowth and bone-graft interface formation within the bone tunnel. Overall, the results of this study demonstrate that fabricating surgical implants at the clinic (fab@clinic) with D3DPs can be feasible, effective, and economical.